78 pages of authentic Victorian and Edwardian era designs presented in various sizes and shapes. Included are lovely floral and floral motifs, geometric and transitional designs showing the influence of art nouveau and more. Transom and sidelight patterns included. An opulent array of Art Deco designs allows artisans to choose among elegant patterns of ovals, ellipses, rectangles, triangles, circles, and many more. 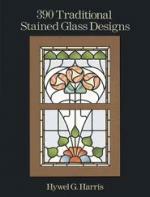 Ideal for windows, sidelights, transoms and other stained glass projects. 136 black-and-white line illustrations. Contains 16 full size designs of flowing abstracts and geometric designs each handcrafted and photographed in full color. Some of the designs were inspired by Kandinsky, Mondrian, and the art deco movement. 12 patterns that can be used as full size or enlarged. The geometric, floral, art nouveau, and Victorian designs in this book have been created for actual home installations in sidelights, front doors, landings, and bathrooms. 32 pages 4 in full color. Over 100 patterns from one of the most flamboyant of artistic periods, including outlines of a lovely winged damsel, florals and vines, a vase, a butterfly, and much more. All displayed in rectangular, oval, circular, and semi-circular frames for use by craftspeople and stained glass workers at all levels of expertise. Everyone loves the sparkling rainbows that beveled glass brings to a room. This book presents patterns for 16 square and rectangular panels made almost entirely with inexpensive, straight line bevels. Stained glass accents add a touch of color to many of the projects. With very little glass cutting required (and all of those cuts being straight), these panels are quick to complete. 32 color photographs and over 100 detailed line drawings of beveled glass windows offering a broad range of design styles including traditional, floral, geometric, birds, landscapes, representational, and contemporary abstract. How-to methods for pattern enlarging, custom designing, framing and more. 70 pages. Decorate your home with wonderful patterns for kitchen cabinets, transoms and corner windows. Traditional and conventional patterns are designed with bevel clusters and accenting bevels. Handy designing tips are included to turn your home into a beautiful showcase. 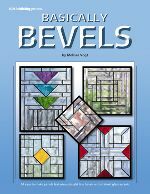 Features over 100 patterns for cabinet doors PLUS nearly 200 additional patterns for transoms, valances and corner windows, all using bevel clusters! 57 pages. Great book to have for custom work! 60 enchanting stained glass patterns all especially chosen to form an attractive fit within the narrow parameters of sidelight spaces. Motifs include: daffodils, poppies, calla lilies, and 17 other stylized flower patterns. Images from nature: animals, from dainty seahorses to dashing coyotes. Geometric shapes: abstracts, Art Deco patterns, stars, circles, and more. Contains 16 corner designs to decorate windows and doors. Designs will fit in just about any 90 degree corner in the house. Great for adding that special little touch to any room. Full color photos and instructions included. 151 designs for sidelights, fanlights, and transoms. Patterns include trellised roses, soaring birds, tulips, geometric and abstract designs. Framed in elongated rectangles which are ideal for transoms and sidelights. 60 pages. Open gateways to beauty with 60 pages of wonderful patterns. This assortment of gorgeous stained glass designs will have crafters of every skill level brightening windows and entryways with graceful foliates and flowing ornamental motifs. Each pattern has been specially formatted for transoms, window panes, and door panels, and can be easily reduced or enlarged to conform to even the most hard-to-fit spaces. Specially chosen for their eloquent simplicity, these elegant floral and geometrical designs - ranging from circular and oval to square and rectangular forms - are intended to enhance traditional transoms, sidelights, and door inserts, but can also be incorporated into various other craft projects. 100 black-and-white designs. A great book for those looking for designs well suited for lead came work. The author has taken inspiration from the English cottage tradition of where even the humblest home had a simple but elegant leaded glass window. The designs work well with bold primary colors but there's plenty of room for your own interpretation. Contains 15 full size designs. All the projects are beautiful and colorful round windows. We used bevels, antique glass plates, jewels and glass globs as added design elements. Each window can be made with these easily available items or cut out and created using your preferred art glass. All designs are shown in full color with instructions. 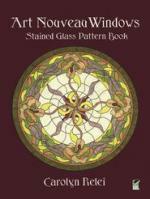 14 full-size patterns of timeless nature done in the style of stained glass windows from the great Hyde Park homes. Many of the patterns are of windows the author has repaired or built for the Hyde Park area. Full color finished projects. Contains over 30 patterns of window panels to decorate residences, vacation homes and business. A variety of designs with a fresh, contemporary flair which will compliment any décor. Designs include florals, ducks, parrots, deer, bonsai, shells, southwest, Victorian, and more. All the patterns are shown in full color for easy glass selection. Upgrade your kitchen with art glass windows, tiles and cabinet doors. Exciting new simple and elegant designs ranging from Contemporary to Prairie to Southwest to Victorian. 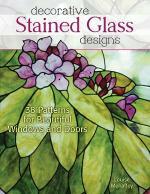 Patterns will show you how to create wonderful effects with textured, beveled, fused, etched, and painted glass elements. Includes a section on designing tile borders, great for kitchen backsplashes. 48 pages of designs of beautiful, full-color, nature scene patterns by exceptional artists including a herons, crane, cattails, rising moon, River of Life, Kokopelli, and many others. Black and white patterns included for enlargement. Contains 56 original designs in the Prairie School of design, which was started by Frank Lloyd Wright. It has designs in circles, rectangles and free-form shapes, in varying complexities for hobbyists of different levels. A collection of smaller panels in the style of Frank Lloyd Wright. These straight line designs are easy projects to cut and assemble. The panels (and suncatchers) can be hung in your windows or easily resized for entry doors, sidelights, transoms or cabinet doors. 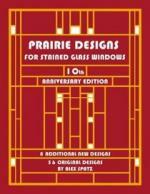 11 Prairie design themes presented in 4 different sizes and shapes (horizontal, vertical, square and a suncatcher) for a total of 44 designs. 180 simple designs in traditional formats for projects suitable for sidelights and transoms. Designs include birds, fish, florals, abstracts, geometrics, more. 64 pages 2 in color. 17 full size designs for quick and easy Victorian projects. Patterns have 10-51 pieces, the largest pattern is 10"x16". Ideal for the beginner to intermediate crafters to bridge the gap between the first project and the more difficult patterns. Every design shown in color.